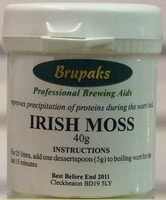 Brupaks Irish Moss is added to the boiling wort to prevent protein haze in all grain brewing. A teaspoon full of "Irish Moss" is added to the boiling wort to aid the coagulation of the proteins during the last 15 minutes of the boiling period of a full grain brew and prevent protein haze forming in the finished beer. It is also known as Copper finings. This 40gm pack from Brupaks is supplied in a resealable tub.